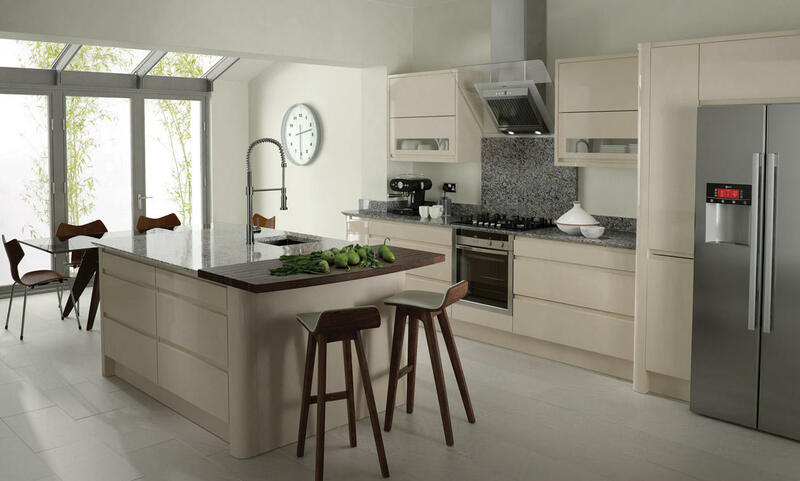 If cool and contemporary are two adjectives you’d like to describe your new kitchen, then Number One Kitchens would like to point you in the direction of Remo Beige, one of our most gorgeous, glossy kitchen designs that will simply transform your home. Beige is the perfect colour for the foundation of your kitchen design. It’s a wonderful and warm-toned neutral shade that is incredibly versatile, blending seamlessly with almost any other colour or shade you’d like to incorporate into your kitchen. The Remo contemporary beige curved gloss kitchen is the perfect example of this. However, you needn’t stick to the beautiful beige colour palette of the Remo contemporary beige curved gloss kitchen if this isn’t to your taste. Indeed, there are actually 27 different colours that you can choose from to customise your beautiful Remo Beige kitchen. Whether you’re looking for a more neutral colour similar to beige, or something a little more vibrant like yellow or blue, Number One Kitchens has something that’s simply perfect for you. Each of these incredible colours is available in either a matte or a gloss finish, depending on what suits your needs. Lower and upper cupboards are featured in this design, as well as a stunning kitchen island which acts as a focal point of the room whilst cleverly doubling up as an extra surface space. The cupboards have a beautiful and smooth design, with a subtle and built in handle that accentuates the design. The peninsula offers a stunning surface for food preparation and entertaining. Finished with a striking contrasting work top, the Remo contemporary beige curved gloss kitchen offers a wonderful light and shade design. You can pick your perfect work surface to compliment your beautiful kitchen doors and bring your dream itchen to life, opting for something to accentuate your design scheme for a beautiful end result.